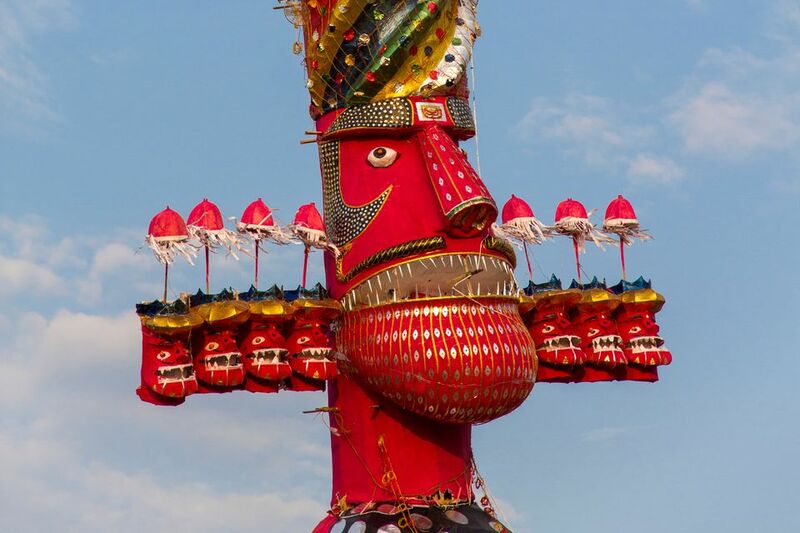 When is Dussehra in 2019, 2020 and 2021? The tenth day of the Navaratri festival is known as Dussehra, or Vijaya Dashami. Dussehra falls on the 10th day (Dashami) of the month of Ashwin on the Hindu lunar calendar. It's widely devoted to celebrating the defeat of the demon king Ravan by Lord Rama. According to the holy Hindu text The Ramayana, Ravan kidnapped Lord Rama’s wife Sita and took her to Sri Lanka. She was found there by monkey god Lord Hanuman, who could fly and joined in the search to locate her. Rama enlisted the help of his troops to built a bridge across the ocean (this is believed to have existed off the coast of Dhanuskodi in Tamil Nadu) and engage in battle with Ravan to get Sita back. It was prolonged and tiring, but Ram ultimately pierced Ravan's body with hundreds of arrows. Finally, he was able to defeat Ravan by using the Brahmasthra (a powerful celestial weapon created by Lord Brahma) and was reunited with Sita. For Hindus, Dusshera is therefore an auspicious time for reestablishing faith in the victory of good over evil. In 2019, Dussehra is on October 8. See calendar. In 2020, Dussehra is on October 25. In 2021, Dussehra is on October 15. Although Dussehra falls on a single day each year, diverse celebrations actually take place on various days before and after it in different places across India. This is important to know in case you want to experience the festivities. In Delhi, Ramlila performances happen all over the city from the first day of Navaratri until Dussehra. The performances, which tell the life story of Lord Rama, culminate with the defeat and burning of the Ravan on Dussehra. See: 5 Popular Delhi Ramlila Shows. In Ramnagar near Varanasi, Dussehra celebrations start around a month prior to the actual day of Dussehra and ends on the full moon after Dussehra. The feature is the world's oldest Ramlila performance, which has been running for nearly 200 years. In Mysore in Karnataka, Dussehra is known as Dasara. Celebrations run for 10 days, starting at the beginning of Navaratri and culminating in a grand street parade on the last day. In Kota in Rajasthan, a three day rural fair is held during Dussehra. In the Kullu Valley of Himachal Pradesh, celebrations start on Dussehra and continue for a week. In the tribal Bastar region of Chhattisgarh, Dussehra is the biggest festival of the year and runs of a lengthy 75 days! It's often referred to as the longest festival in the world. Celebrations intensify three days before Dussehra, and reach their peak a day after Dussehra. In West Bengal, Dussehra is celebrated as Durga Puja, with the immersion of Durga idols on Vijaya Dashami. Find out more about Dussehra in this Dussehra Festival Essential Guide and see how it's celebrated in this Dussehra Photo Gallery.